[:en]UNIKOP PATENT will be held at KTO TÜYAP Exhibition Center on 27-28 April 2017. “UNIKOP PATENT” organized by Konya Chamber of Commerce, UNIKOP, KTO Karatay University, Selçuk University, Konya Technopolis, Selçuk TTO and KOP Regional Development Administration will be held on 27-28 April 2017 at KTO TÜYAP Exhibition Center. UNIKOP Patent 2017 will be organized simultaneously with the Konya Industry Summit (KONELEX 2017, KONMAK 2017, İSKON 2017 and KONYA SHEET PROCESSING TECHNOLOGY FAIR) at KTO TÜYAP Expo Center between April 27-30. The participation of a total of 70.000 visitors and the exhibited patents can be applied to the inventors who have applied for the patent for the expected activity. At the same time, it is planned that representatives from universities, research centers and private sector institutions will be brought together in order to create technological and financial cooperation. It is to promote the products / services / activities of the persons or organizations in the position of product or service provider in complementary or supportive form in terms of product or technology development, to support the establishment of R & D clusters and cooperation. The inventors who are patents for “UNIKOP Patent 2017” or who have patent applications can apply from “unikoppatentfuari.com” address between 20.03.2017 and 17.04.2017. [:tr]UNİKOP PATENT 27-28 Nisan 2017 tarihlerinde KTO TÜYAP Fuar Merkezinde gerçekleştirilecektir. Konya Ticaret Odası, UNİKOP, KTO Karatay Üniversitesi, Selçuk Üniversitesi, Konya Teknokent, Selçuk TTO ve KOP Bölge Kalkınma İdaresi Başkanlığı iş birliği ile düzenlenen “UNİKOP PATENT” 27-28 Nisan 2017 tarihlerinde KTO TÜYAP Fuar Merkezinde gerçekleştirilecektir. 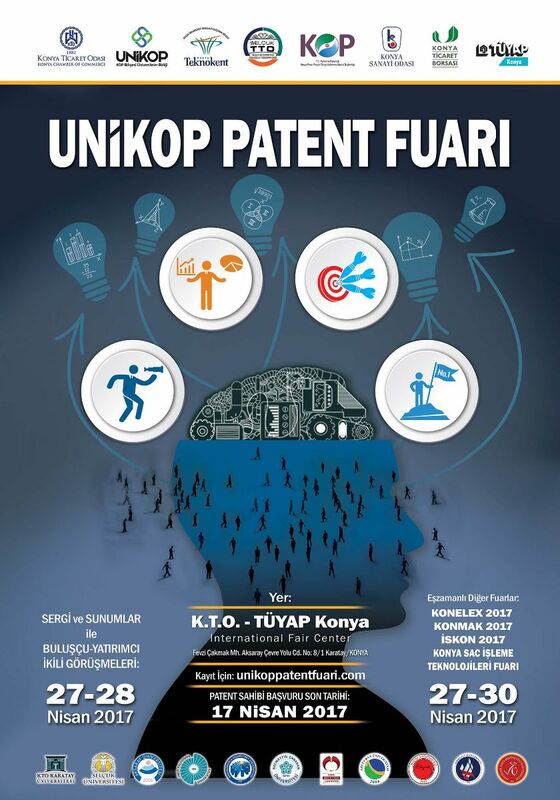 UNİKOP Patent 2017, KTO TÜYAP Fuar Merkezi’nde 27-30 Nisan tarihleri arasında Konya Endüstri Zirvesi (KONELEX 2017, KONMAK 2017, İSKON 2017 ve KONYA SAC İŞLEME TEKNOLOJİLERİ FUARI) ile eş zamanlı olarak düzenlenecektir.